Hiroshi Tanahashi sat down with Extra Mustard to talk about his desire to take the Ring of Honor championship back to Japan and his undying love of baseball. New Japan Pro Wrestling was dealt a serious blow this past January when Shinsuke Nakamura gave his notice. The old guard was devastated that the beloved Nakamura would ever consider leaving for the WWE–which is why his departure was kept so quiet until the end. As much as his exit hurts the promotion, New Japan will continue to thrive as long as its ace, Hiroshi Tanahashi, is healthy enough to play a major role. Nevertheless, even Tanahashi was in shock that Nakamura left for greener pastures in America. The 39-year-old Tanahashi is the face of Japanese wrestling. Despite IWGP champion Kazuchika Okada’s popularity, it is Tanahashi’s signature strumming of the air guitar that is mimicked by children all over the sprawling landscape of Japan. Tanahashi confirmed that there has been no communication between himself and the WWE, and that his heart remains with New Japan. Tanahashi does, however, have a new goal in mind for 2016. New Japan has a lucrative working agreement with Ring of Honor, and Tanahashi wants Jay Lethal’s world title. 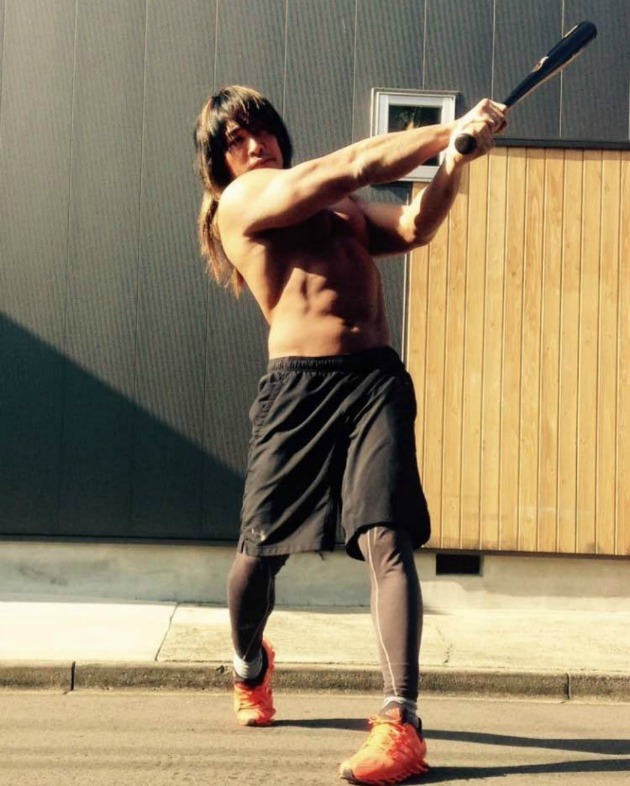 Although he is a natural in the ring, Tanahashi’s childhood dreams were filled with baseball diamonds. He grew up infatuated with the sport, one he still loves. ​In addition to Japanese baseball, Tanahashi keeps a close eye on Japanese players in the United States. He will follow Nakamura wrestle in the WWE, he explained, the same way he watches Masahiro Tanaka pitch for the New York Yankees. ​Repeated shoulder, back and knee injuries have forced Tanahashi into a steady dose of tag team action in 2016, and his devastating frog splash is one of the greatest sources of self-inflicted pain in the entire business. But Japanese wrestlers protect the kayfabe culture of wrestling to the point where Tanahashi is unwilling to admit even the slightest of problems. Unlike his current health status, Tanahashi offered a wealth of perspective on the secrets to success in wrestling. He is a perfect example of someone who has continuously improved since his debut in October of 1999. “The most important part of pro wrestling is the connection to the people,” explained Tanahashi. “From 2005-2010, I was a heel–a natural heel. I prefer to be a face, but when I was a heel, I learned that the heel is so important. Babyface against babyface makes no sense. Heel versus babyface is very good business. New Japan and Ring of Honor offer a contrast in styles, particularly noticeable for the Japanese wrestlers. Tanahashi noted that the pace in America, showcased in Ring of Honor, occurs far too quickly to tell an effective story in the ring. Tanahashi explained that the Young Bucks, comprised of Nick and Matt Jackson, and Kazuchika Okada are examples of workers who excel in delivering well-paced, logical storytelling in the ring. “I love working with the Young Bucks,” said Tanahashi. “They are big favorites here in the U.S. and Japan, and people love cheering for them. Tanahashi is the proud father of two children with a twelve-year-old daughter and a ten-year-old son. His kids love to watch their father wrestle, and especially enjoy when he plays the air guitar.